Aroostook County has received its first measurable snowfall and that has those in the tourism industry thinking snowmobile season. CARIBOU, Maine — Aroostook County has received its first measurable snowfall and that has those in the tourism industry thinking snowmobile season. Gary Marquis, superintendent of Parks and Recreation in Caribou and a member of the Aroostook County Tourism (ACT) board, will once again deliver the Snowmobile Trail Report this year. The report will be available on Channel X Radio, WHOU, WAGM-TV and in local newspapers this snowmobile season, but to attract more snowmobilers to the region a greater emphasis is being placed on the internet and social media. A link to the report will also be available on www.visitaroostook.com and on the Aroostook County Tourism Facebook page. ACT, an affiliate organization of Northern Maine Development Commission, staffed two snowmobile-related events in October, the Snowmobile Grass Drags in New Hampshire and the Maine Snowmobile Show in Augusta. “The time to attract the snowmobilers is before the snow falls and early in the season when northern Maine often has snow and other parts of Maine lag,” said NMDC’s Alain Ouellette, planning and development division director. Snowmobiling in Maine is estimated as a $300-$350 million business, responsible for 23,000 jobs statewide, Ouellette said. 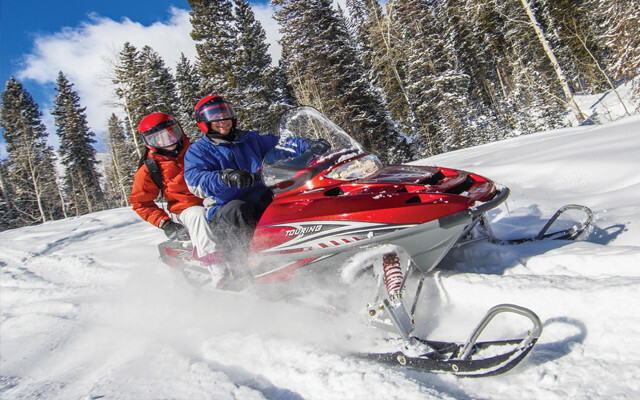 Aroostook County boasts more than 2,200 miles of trails and national snowmobiling magazines routinely rank the trail system in northern Maine as a “Top Ten” destination in North America. Per research conducted for the Maine Office of Tourism, tourists contributed $139 million to Aroostook County in 2015. The tourism industry in Aroostook represents 2,469 jobs and $45,965,607 in total earnings and nearly $13-million in total taxes. Aroostook County Tourism is dedicated to improving the economy of northern Maine. Working under the brand Aroostook, “the Crown of Maine,” ACT promotes some of the region’s greatest assets like its pristine beauty, diverse culture, storied history and warm, hospitable people to potential visitors from around the world. Funding for ACT is provided in part through a grant from the Maine Office of Tourism.